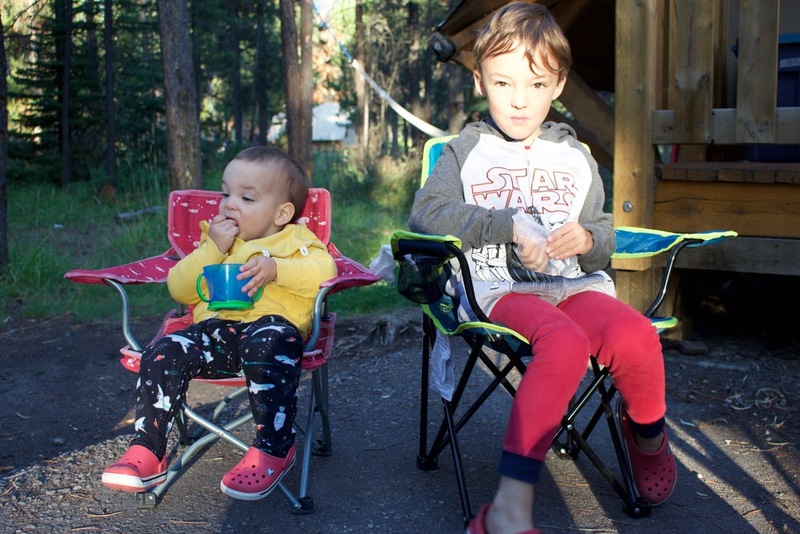 Last week we took the boys camping in Jasper. Every year I get really excited for that carved out time to disconnect from all the little things to make space for the important things, like The Bear's Paw Bakery and selfies in the mountains. Er - I mean, nature and family. My husband lovingly transformed me from terrible camper to average camper. And by lovingly I mean, disgraced me into submission. I have always enjoyed the outdoors and exploring. However, I haven't exactly been what you might call a 'natural' camper. I think my problem is that I romanticize camping; then when I wake up covered in dew and I have to undo about 8 zippers just to go pee and pretend that I'm totally OK with not having a mirror to obsessively check the growth of my chin hairs? Not so natural. Alas, my wild, forest loving husband is the yin to my yang and I've discovered that as long as I keep the cooler stocked with beer he doesn't seem to notice that he does everything. I was in charge of food, which essentially meant I scrolled through Pinterest for days on end coming up with the ultimate camping menu; only to give up last minute and purchase three days worth of hot dogs, bacon, and eggs. We put our camping supplies in our rented minivan and then I added everything else we own last minute, for good measure. Off we went, our happy little clan, headed towards an idyllic mountain vacation. 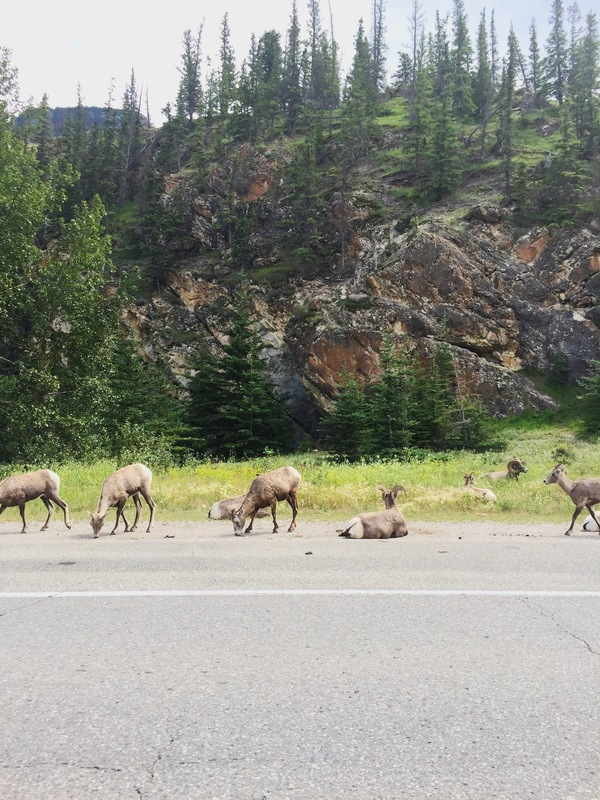 Both kids did well on the 3-hour drive from Edmonton to Jasper and were excited to be greeted by a tribe of mountain goats. The cabin was great. It was actually quite a bit more spacious than we had anticipated. It definitely beats staying inside a tent when your children are young. Even still, I gingerly held my breath anytime I had to turn over in my sleep. The crinkling sound of my sleeping bag always seemed to interrupt the steady breathing of our youngest. Since the sound of rolling over caused disruption amongst the sleeping, then most certainly that twinkle in my husband's eye was going to have to wait until we returned home. You can bring clean clothes, you can bring soap, you can even shower your children; but, your children will never be clean. Bring enough S'mores ingredients for you and the neighbors. They might just happen to be from the Netherlands and have not experienced a s'more before. Stay up a little later with your loved one. Sit by the fire and talk uninterrupted. Maybe even slow dance under the open sky while your children sleep a couple feet away. It had been awhile since I noticed how easily my head rested in the crook of his neck. That connected moment with my husband was the highlight of my trip. Let's get real, you are basically spending the next few days as a simple homesteading family from the 1800s. Everything about the experience is slower, longer and harder. So while you may want to have the ultimate, Pinterest-worthy camping experience; relax. Your children will survive on hot dogs. In fact, they might be better because of it. You will probably still have cell phone service. Which is great if there is an emergency; read, emergency. Even if Prince Harry himself likes your Instagram photo, try really hard to stay true to disconnecting. It is the whole point, after all. Plan a couple day trips, but leave space for free time. It's easy to fall into the pattern of constantly giving your children framework for fun. However, I think there is something to be said for simply enjoying the campsite. My boys were content the majority of the time playing in the dirt, making friends with neighbors and running through the trees. When we returned home from this trip, I slept like a teenager for two days. Sometimes the best memories are the most exhausting to make. I'll save these photos for my boys to look back on someday. They will see a cool cabin, happy kids and the astonishing beauty of the Rockies; and that, that means we did right by them.